Check-In time is between 3pm to 6pm. Check-Out time is by 12pm. Can we have an early check-in/ late check out? Yes, you may check-in early/check-out late up to an hour, subject to availability. Please check with reception. Can a member of the public book the chalet? •	A photocopy of your NRIC (front and back). Bookings can be made 60 days in advance. Payment to be made within 7 days upon receiving email confirmation. How can I check the room rates? What is the minimum number of nights I have to book? Can we authorize family/friends to check –in/check out on our behalf? Yes, we will need a letter of authorisation letter from the person who booked the chalet. Click here for the letter. What does the authorised person need to bring for check-in? There will be no refund for cancellation of confirmed bookings. Will we have to pay a Security Deposit? Yes. Security deposit is $100 for Suites and $200 for Villas. We only accept cash as security deposit. Can we book a Rooftop BBQ pit without booking a chalet? No. The Rooftop BBQ pits are exclusively for chalet guests only. How can we go about booking a Rooftop BBQ pit? You can email to rooms@csc.sg with your room reservation number, name and contact number. Booking is on a first-come-first-served basis. Please reserve in advance to avoid disappointment. How many BBQ pits can we book per night? One pit per room reservation. What is the size of wire mesh required? What is cost of the Rooftop BBQ pit? Is there a surcharge for catering? There is a surcharge of $150 for external caterers. 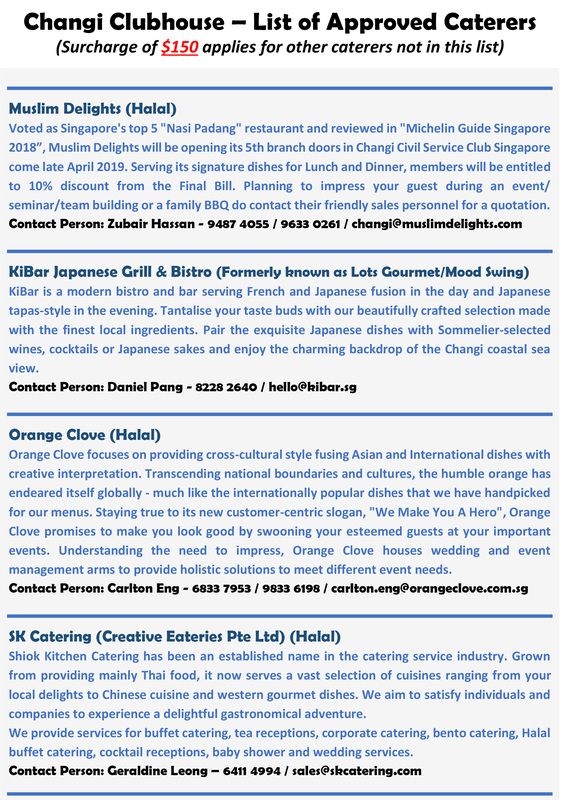 Please Click here for the approved list of caterers. There is no surcharge for bringing in bbq food currently. Can catering set-up be done at the rooftop BBQ pit? Yes but the setup must be done within the area of the allocated pit and must not obstruct the walkway or inconvenience users of the other pits. The Club will not be able to provide alternative locations in the event of rain. How can I book the Pavilion BBQ Pits? Online at https://gateway.csc.sg/webclub/facilities/ or make a reservation at our Front Office (at Block B). How do non-members make the payment? Payment can only be made at Changi Clubhouse within 7 days upon email confirmation. How many pits can a person book? Maximum of 1 pit. If more pits are available on the day itself, you can book an additional pit at the Front Office. What are the rates and operating hours? What is the difference between the Superior Suite and Deluxe Suite? Superior Suite – Single bedroom with 2 Super-Single beds. Deluxe Suite – Single bedroom with 1 King-size bed. What is the difference between the Superior Villa and Deluxe Villa? Are pets allowed in the chalet? Is it possible to get another access card? Yes, we are able to provide additional access cards. However, a refundable cash deposit of $20 by per access card is payable. Can we request for extra towels? Yes, maximum two per room per period of stay. Can we request for an extra mattress? No extra mattress is provided. Yes, subject to availability. Please request in advance to avoid disappointment. What is the size of the baby cot? Yes, free WIFI is available. No password required. Are there cutleries provided in the room? Yes, Cutleries such as plates, forks, spoons and chopsticks are provided in the room according to the number of bedrooms. No additional provision available. Are tables and stools available for renting? Stools can be rented at $1 per stool. Chairs can be rented at $2 per chair. Tables can be rented at $7 per table. How can we book a BBQ pit for Villa? A portable Gas BBQ pit is located outside each Villa. You may drop us an email at rooms@csc.sg to indicate that you would like to have the Gas BBQ pit. Housekeeper will provide gas tank and instructions to operate once payment is made. What is cost of the Villa BBQ pit? Do I need to have wiremesh? Yes. The size of the BBQ pit is 50cm by 18cm. Is the swimming pool open to public? No, access to the swimming pool is exclusively for our members and chalet guests only. Entry fee is applicable for chalet guests. I am a chalet guest, how many of us can go to the swimming pool? Each access card can bring in up to 4 guests to the swimming pool. Entry fee per guest is applicable. I am a member, can I bring my guests to the Swimming pool? Yes, except for Social Members, all members can bring up to 4 guests to the swimming pool. Entry fee per guest is applicable. I am a social member, can I use the swimming pool? Yes, however there will be an entry fee of $5. Are there towels provided at the swimming pool? Towels can be rented at $1 per towel for the first three towels and $3 per subsequent towel. What is the operating hours for the Swimming pool? Last entry will be at 2030HR.